Readers were left with quite the cliffhanger in Goddess Interrupted. I'm not going to spoil things for the sake of those who haven't read this series, but I will say that it was a very intolerable one. I remember reading it, and it was one of those moments where you are Bradley Cooper. The Goddess Inheritance begins pretty much where Interrupted left off and everything spirals from there. Kate was put into one of the worst positions I've ever read of. If she does one thing, she risks losing so and so, and if she goes the other, she'll lose other so and so. I've never read a book where things just kept getting worse and worse and darker and darker for the characters. Sure, I've read books where the stakes were pretty high and it involved sacrifice and such, but never--never--have I read it where it was this intense. And I think that's the main reason why I couldn't stop reading this book. I couldn't help but wonder if the impossible happy ending was even possible. Kate necessarily hasn't bothered me at all in previous books. She had a little bit of a martyr complex going on, but I understood where it came from and I admired her confidence, stubbornness, and courage. However, I just found it to be a little to much. Maybe this is because I haven't experienced undying love, but I sure have read about it in other books. The girl or guy will risk everything to protect the ones they love, but I felt that Kate's protectiveness and martyrdom was overbearing and too much. Like, I got the point on the first page. You don't need to express it on every page now. Besides that, I was flying through book. The high stakes and action kept me interested and glued to the story. It was hard for me to put down. Just the mention of Cronus in this book made me want to become a goddess just so I could bash his head in or something. He was such a bad guy and to have Calliope/Hera on his side, he was a force to be reckoned with. But he wasn't just a bad guy set on destroying the world and everything in his path. He had dimension. What was great about him is that he just wasn't the villain that readers think him to be. He actually was a person--well, Titan. My only real complaint would be the lack of imagery. And after three books, including The Goddess Legacy, I still didn't have a solid image as to what Kate or Henry or Ava or Olympus looked like. What I conjured was something vague at most and sometime inaccurate to the story. It was very frustrating at times and is what made the series a little less enjoyable for me. The Goddess Inheritance was a great and hear-racing ending to a wonderful and entertaining series. You immediately connect with the characters. In fact, I cried not only in The Goddess Test, but also the The Goddess Legacy and The Goddess Inheritance. It's hard not to be emotionally invested in characters that endure so much pain and betrayal, but get right back up in the most gloomiest times for them. And for an author to actually manipulate my feelings--not once, but three times--is amazing. Lovers of Greek mythology, a fast-paced plot, and relatable characters will enjoy this series. This is such a great review! I love your quote from Bradley Cooper too! I agree with some of the issues you said. The martyr thing did get a bit much. You can read my review HERE. oh my, I am so excited! 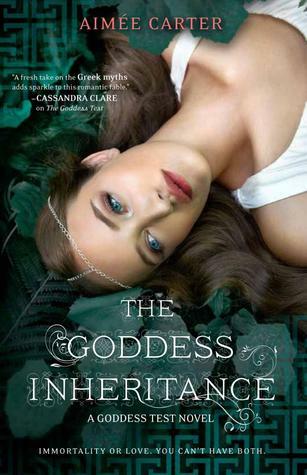 I LOVED The Goddess Test but wasn't the biggest fan of Goddess Interrupted, I honestly forgot about the cliffhanger so I am going to google it right now :P, but I am SO glad that you loved The Goddess Inheritance and that it is full of action! but yea, Kate does seem to always victimize herself and that annoyed me in books 1 and 2, hope that doesn't continue in this book. I'm going to be reading this one soon, but I've heard that it is just so sad! I don't know what I will do if she truly has to make such a sacrifice. Kate does get on my nerves because she seems weak at times, so I'm hoping she will rise up in this one. Great review.